Cynthia LeCount Samake is a specialist in festival costumes, traditional clothing and handmade textiles of Bolivia and Peru. 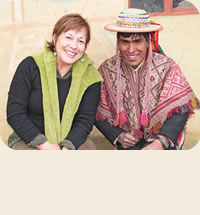 Cynthia operates her own adventure travel company specializing in "Arts and Festival Tours" for small groups to South America. Cynthia LeCount Samake loves sharing her knowledge and enthusiastically shares her expertise with all who are interested. She is an amazing person who is passionate about the traditional textiles of exotic cultures in far away destinations. Cynthia LeCount has traveled to 48 countries and counting—as she documents people wearing, using or making indigenous costume and typical garments. Cruising is new to Cynthia but she is really looking forward to sharing her knowledge over the course of this sailing. Cynthia LeCount Samake has taught in the Department of Environmental Design at UC Davis, as well as at other California universities. She has led many successful study tours, and has acted as Project Leader for numerous University of California Research Expeditions (UREP) to South America and Southeast Asia. Cynthia LeCount Samake has also been guest curator of many exhibitions of Andean festival masks and costumes, including Colors of the Highlands: Dress of Peruvian Women in Los Angeles, Con Mucha Alegria at the San Francisco Craft and Folk Art Museum and at the Bowers Museum in Santa Ana, California; and! VIVA CARNIVAL! the Daniel J. Crowley Memorial Exhibition, at the University of California, Davis, Design Gallery. Cynthia LeCount Samake has shared her curatorial expertise and collection of Bolivian costumes at the Dancing in the Streets exhibit of Carnival costumes at the Los Angeles Craft and Folk Art Museum, and at the Carnival exhibition opening at the Museum of International Folk Art in New Mexico. Over the course of over 29 trips to South America, Cynthia LeCount Samake has amassed an unprecedented collection of slides in her specialty areas. This array includes artist portraits, detailed steps to the fiber processing and spinning, weaving and knitting, costume making and maskmaking, as well as vivid depictions of festival revelers on site---and much more! Cynthia LeCount Samake is the author of Andean Folk Knitting: Traditions and Techniques from Peru and Bolivia (Interweave Press, 1993) and is currently at work on a book and video about Bolivian Carnival. Master's degree in Art History from the University of California with a specialty in ethic costume.